Ceci Anschutz uses one word to sum up her journey with kidney cancer. "Scary." Two years ago, the Neenah girl felt extreme pain in her side. Tests found she had a Wilms' tumor the size of a small pineapple. "That just doesn't happen. Maybe in the movies or in a book or whatever but not to my kid," said Ceci's mom, Alissa. "So then sitting in the office and hearing that and seeing this mass inside of her body, I mean you just fall apart." Ceci was just 6-years-old at the time. She had to endure surgery to remove the tumor, radiation that made her sick and 25 weeks of chemotherapy that took her hair but not her sunny disposition. "I loved being bald. It's so nice," she said. "She made the best of it. She always had a smile or silly face. Her energy was infectious. It made everything easier to take in, easier to handle," explained Ceci's mom. Alissa quit her job in order to care for her daughter. Now relying on one income for the family of four, they turned to CCFF for help. "The Children's Cancer Family Foundation will give families up to $3,000 per year if they have the financial need to help with their medical expenses, with their everyday living expenses, whatever it might be," said President and Co-Founder Sarah-Beth Janssen. CCFF also focuses on keeping the family together during such a trying time. "We have different events that we do throughout the year that we put on to let the families come together, forget about fighting cancer for a day and just have fun." The Anschutz family enjoyed a Green Bay Blizzard outing, a girls day at the spa and they're returning to the 13th annual Strike Out Cancer Day on Tuesday, August 21st at 7:05pm at Fox Cities Stadium. "I mean there's all of these families who have this awful thing in common and they deal with it on their day to day, but they come to this event and it's just fun," said Alissa. Last year, Ceci got to throw out the first pitch. "It was really fun," she said with a smile. Families also get to meet former UW Badgers star and NBA player Sam Dekker and his new wife, Olivia. The couple looks forward to helping fundraise for the families every summer. "I just hope that it gives them some solace in a very, very tough time in their lives," said Dekker. 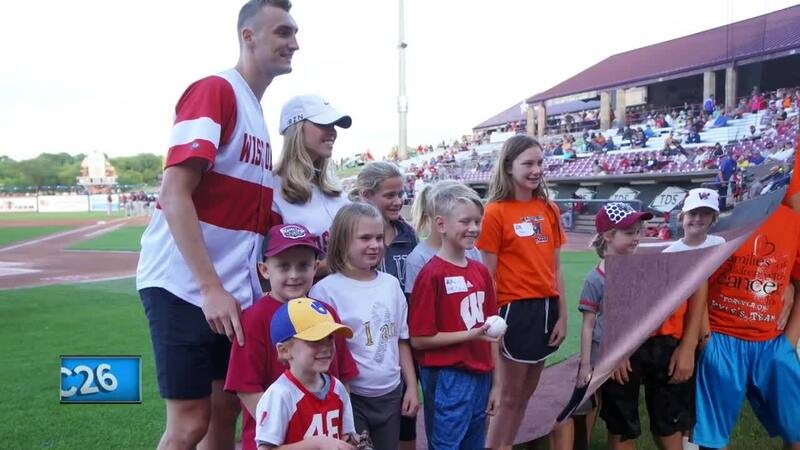 During Strike Out Cancer, families dealing with the disease are treated to free food, music and watching the Timber Rattlers take on the Peoria Chiefs. The T-Rats players will be wearing University of Wisconsin themed jerseys that will be auctioned off, and Dekker will hold a charity autograph session. The first 1,000 attendees will receive a free Dekker Bobblehead . With a portion of the ticket sales also going to CCFF, the organization hopes to raise around $9,000 to help more families. "We're just so very grateful for the support that CCFF has given our family, and we're honored to be a part of their community," said Alissa. Ceci is now 9-years-old and cancer free. "It feels amazing that I didn't have to go through as much as other kids have to." Her mom is now paying it forward by volunteering to help CCFF with their events. She also works with social workers to connect families with cancer resources such as the Foundation. "I'm so excited to be in a position now where we can kind of make the experience matter. We can give back to families who are just starting and kind of commiserate and connect and know where they're coming from." Strike Out Cancer is a great avenue for families to lean on each other, and no matter what the scoreboard says, Ceci will be celebrating her own victory.